Bhopal/Rewa: The New Year has come with delicious and healthy surprise from mostly tribal children in eight villages of four districts in northeast MP, with local women contributing edibles and deciding to cook tasty, nutritious dishes for kids every day. In what is a typical example of community initiative and involvement towards eradication of malnutrition and related diseases, the women in the eight villages – aided with specialized training – have decided to cook delicious dishes from locally available food material every day. These dishes would be served to kids at day care centres run by the local NGOs with support of Bhopal-based Vikas Samvad. These dishes would be in addition to the daily nutritious diet already being provided to the kids. The villages include Khairaha Siyanagar and Gadhuaai in Rewa, Birgarha and Kaimaha in Satna, Karondi and Jangela in Umaria and Manasnagar and Kota Gunjapur in Panna. 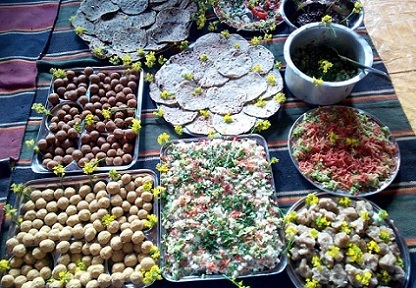 So during the yearend, the day care centres at the Rewa villages saw women cook dishes like mixed porridge (khichdi), momos, parathas mixed with spinach, mustard and drumstick leaves, mixed vegetables, bottle gourd kheer (sweet preparation with milk), gram flour laddoos and nutritious mix laddoos. For this, they had brought in raw stuff from their homes and kitchen gardens that they have been trained to nurture since last six months. “The aim is to involve the local community in movement against malnutrition and show that locally grown and easily available material can be used to serve delicious local flavor yet nutritious dishes to children,” right to food campaigner Sachin Jain of Vikas Samvad said. The only necessity is to train the women a little about nutritive qualities of the food stuff available and how they could be made edible for the kids. Apart from the nutritious dishes, the Vikas Samvad initiative also includes training of women and local NGO activists in Ayurvedic/herbal oil massage. The ‘Mahamash’ oil is known to improve the nutrition absorption capability and metabolism of the children, thus developing their immunity against malnutrition, Jain said. The massage therapy has also been launched in the eight villages. “If the initiative is successful, they would be replicated in more villages,” Jain said.